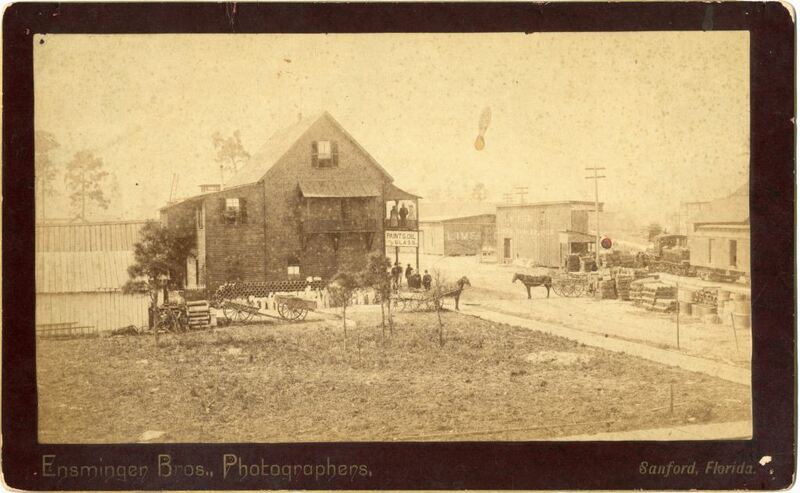 The intersection of Second Street and Oak Street in Sanford, Florida in 1884. When General Henry Shelton Sanford (1823-1891) first established the City of Sanford, he laid out the streets on a grid plan. Streets running toward Lake Monroe were given names of native Florida trees, while streets running parallel to the lake were numbered. Seal on back of photograph, "Ensminger Bros., Photographers, Sanford, Florida"
Original 8.5 x 5.5 inch black and white photograph by Chase & Company, 1884: Chase Collection (MS 14), box 211, folder 3.30A, item CC 114, Special and Area Studies Collections, George A. Smathers Libraries, University of Florida, Gainesville, Florida. 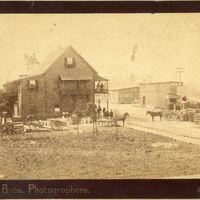 Digital reproduction of original 8.5 x 5.5 inch black and white photograph by Chase & Company, 1884. Chase Collection (MS 14), box 211, folder 3.30A, Special and Area Studies Collections, George A. Smathers Libraries, University of Florida, Gainesville, Florida. Chase & Company. “Intersection at Second Street and Oak Street.” RICHES of Central Florida accessed April 20, 2019, https://richesmi.cah.ucf.edu/omeka/items/show/566.